Where to Download Windows 7 Theme For Free? Do you know that you can go online and download Windows 7 theme at Microsoft site for free? 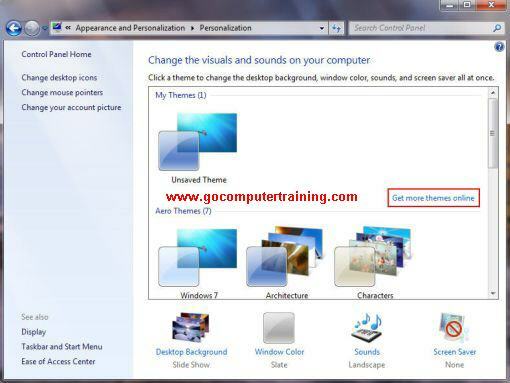 First of all, feel free to read another tutorial if you are not familiar with Windows 7 theme. Well, Windows 7 uses the term "desktop theme" to refer to the combination of the desktop background, window color, sounds, and screen saver. This article will show you how to get more desktop themes for free. Open Control Panel in Category view. In Control Panel, under Appearance and Personalization, click Change the theme. From the Personalization window right-hand pane, under My Themes, click on Get more theme online. This will takes you to the Personalization Gallery of the Windows Web site. Select the theme that you wish to download and click the Download button. Click Save button and Windows saves a .themepack file containing the theme settings in your Downloads folder. Double-clicking the .themepack file adds the theme's files to your personal Themes folder and to the My Themes section of the Personalization window. Open any web browser such as Mozilla Firefox or Internet Explorer. In the search box, type "free windows 7 theme" and press Enter. From the result come out, click on any link.